Tropicana has bloomed (a photo is below), leaving only Garden Party yet to bloom this year. Its first bud has been mangled by some insect, so we will have to wait. Its growth seems to be OK so I suspect it will just be a matter of time. I've begun to look for a replacement for Sunbright but was disappointed by the selection at Home Depot. I will check there again and at Lowes, and will find something nice to plant. Otherwise, the garden is doing quite nicely. We've had about a week of showers and rain, so everything is well watered. Most of the roses are still in bloom and providing a dazzling spectacle. Most of the other garden plants, such as the rhododendrons, have faded, leaving the roses as the main attractions, though the hydrangea is getting ready to bloom. 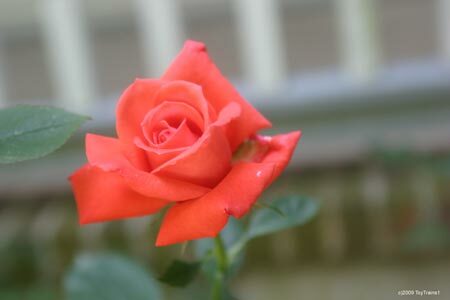 I've updated the web site with many more photos of the roses in bloom. Here's Tropicana. I love the flowers and the way you show them! gardening is one of my biggest passions.